This tournament will consist of any and every member that wants to play. The winner of this tournament will get a rank-up, and if you are in proto gold, you will be considered for cyberdark dorm. As soon as all the participants are in, the tournament will begin on saturday at the latest. We need more people to join. If this is still going, Im totally in. This sounds like a lot of fun. I can't wait to duel you guys and see how you all play. But one thing Luck... You put TheAss on the score chart at the bottom on there twice! I lost to gohan dragon twice in a row without putting up a fight. 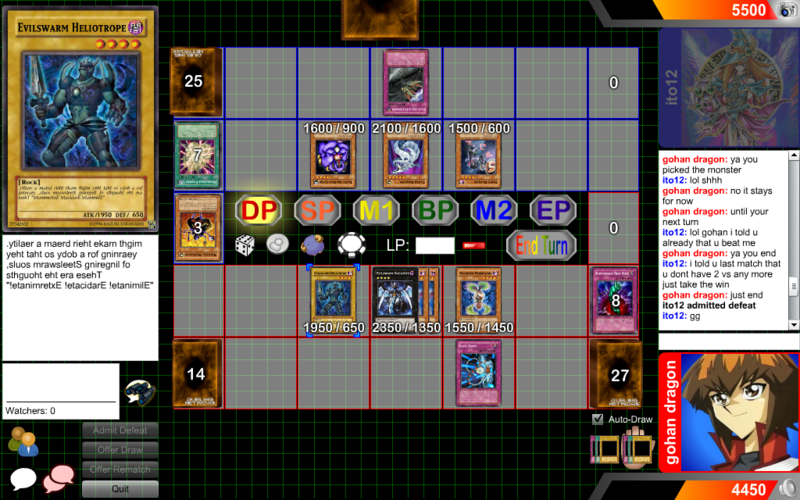 I was thinking I wasn't allowed to do a certain amount of damage in 1 turn so i held back. Even ask jospehe14. He knows I should've won. But you know how it is "should'a, would'a, could'a". Haha, Penguin is right! He could have won, but he didn't pull the trigger. So, I won.